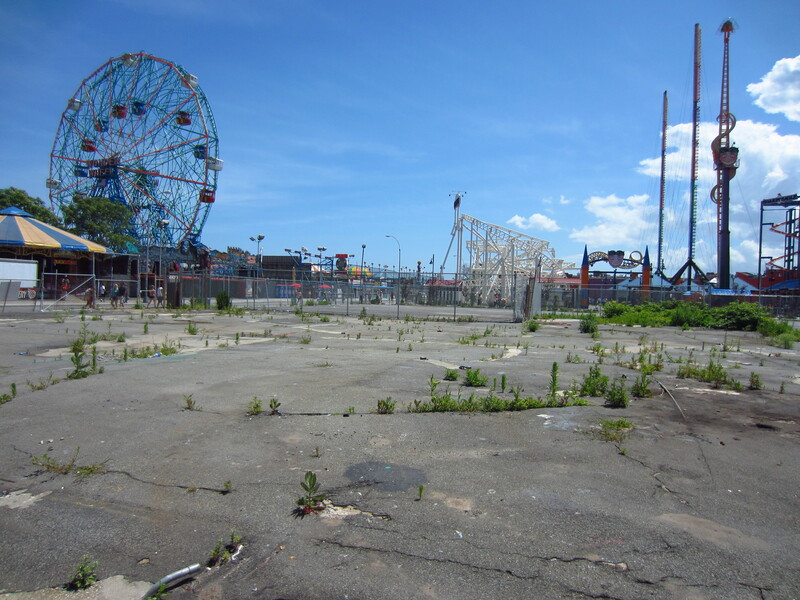 I always imagined Coney Island to be a bit of a living museum; a relic of the glory days of carnivals. Back when hot dogs were just getting popular and clowns were still funny. You know, ferris wheels for a nickel, haunted houses with a guy dressed as a ghost to scare you (boo! ), winning a toy bear for your sweetie with the ring toss, crooked carnies, and little kids wearing their sunday best to eat a fairy floss. 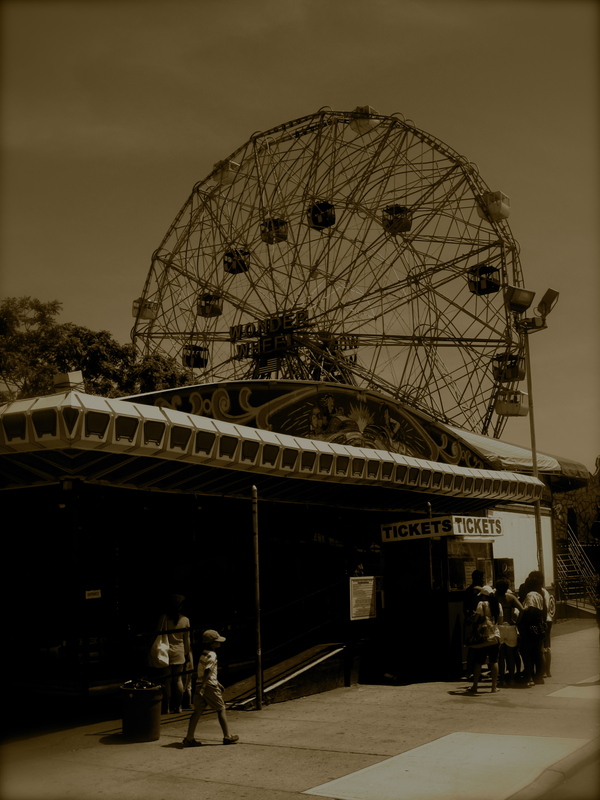 It’s been said that Coney Island’s popularity dropped off in the second half of the 20th century, and when Cindy and I arrived, I expected a handful of dog walkers, creaky warped boardwalks interspersed with weeds, outdated roller coasters built of wood, all the old-fashioned stuff like bumper cars and ferris wheels. When we got there…well, it’s still basically like that, but it’s super popular. The shops and rides look old and hand-painted (especially when compared to modern rollercoasters, like the outrageous 240km/h Ferrari one in Abu Dhabi). There’s a few vacant lots spattered around, with unkempt and littered with long-abandoned equipment. 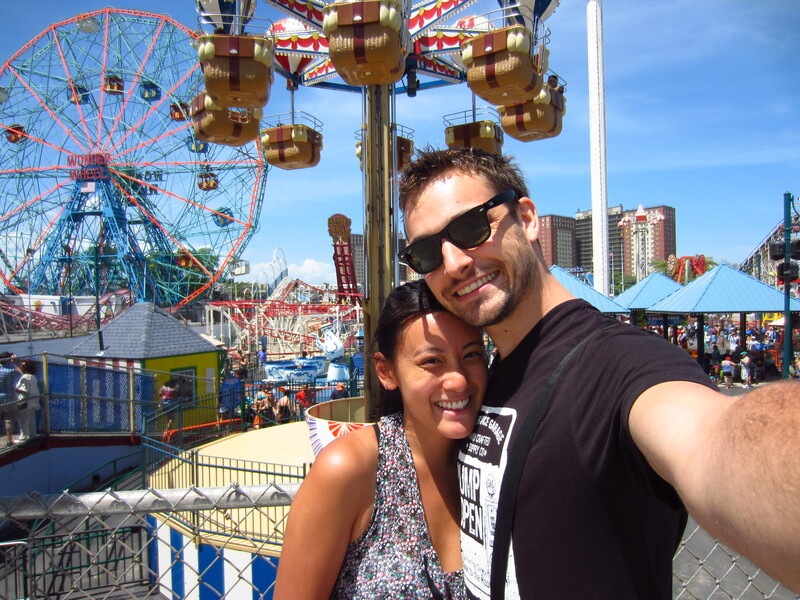 But I should still stress this – Coney Island is a lot of fun! 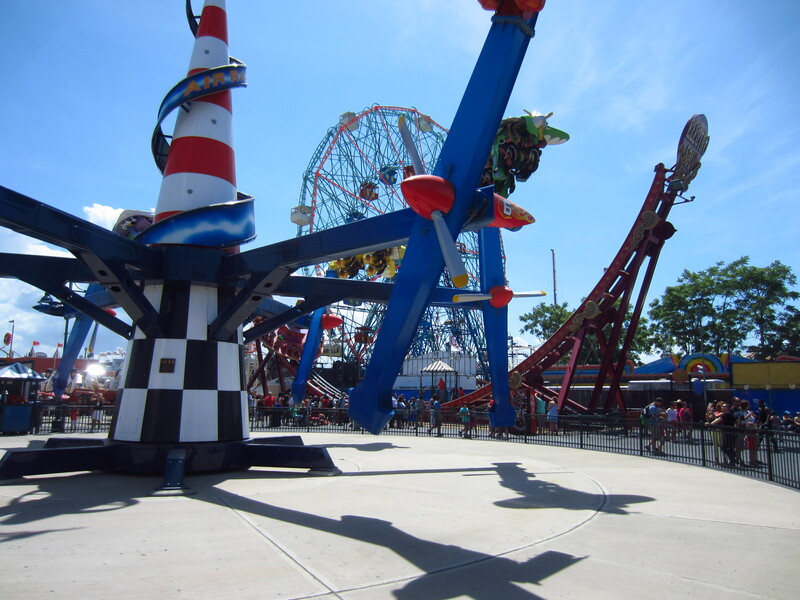 The theme parks at Coney Island are not one big park (like Disneyland or Asterix in Paris), but many small businesses, a colourful patchwork quilt draped upon the boardwalk next to the sea. Each section has it’s own rides, and is fenced off from the one next door. For $35, we bought a fun card with 40 credits. I think the ride credits are transferrable from park to park. Cindy and I didn’t realise this until after we already rode the upside-down airplanes at Luna Park ride twice in a row! Up, around, over, upside down, barrel roll, and feeling queasy! A sunny day at the carnival! 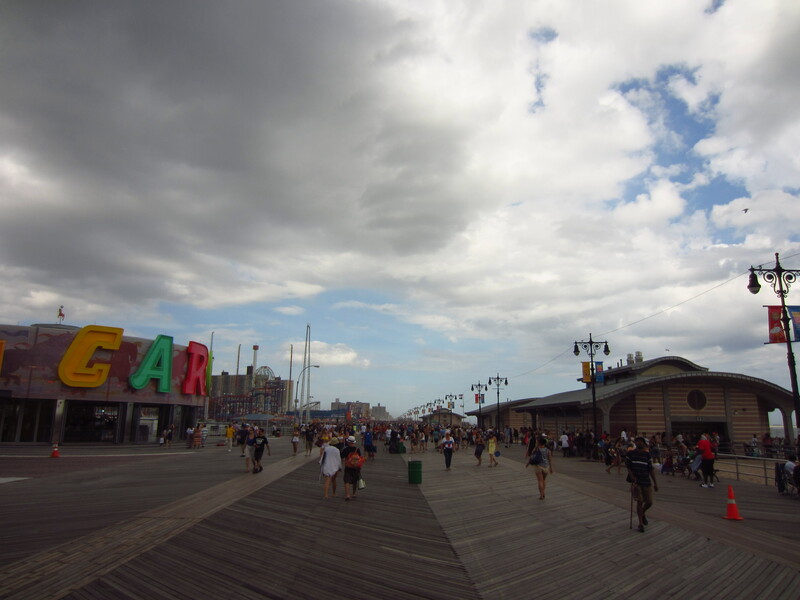 The beachfront is massive, and on this particularly hot summers day, half of NYC had come to catch some rays. The boardwalk, wide as a highway, was a nice enough place to amble along, although thousands of other pedestrians weren’t making the walk any more relaxing. Soon enough, however, the clouds rolled in and stinging sand starting spitting across the beach, and the crowds dispersed. 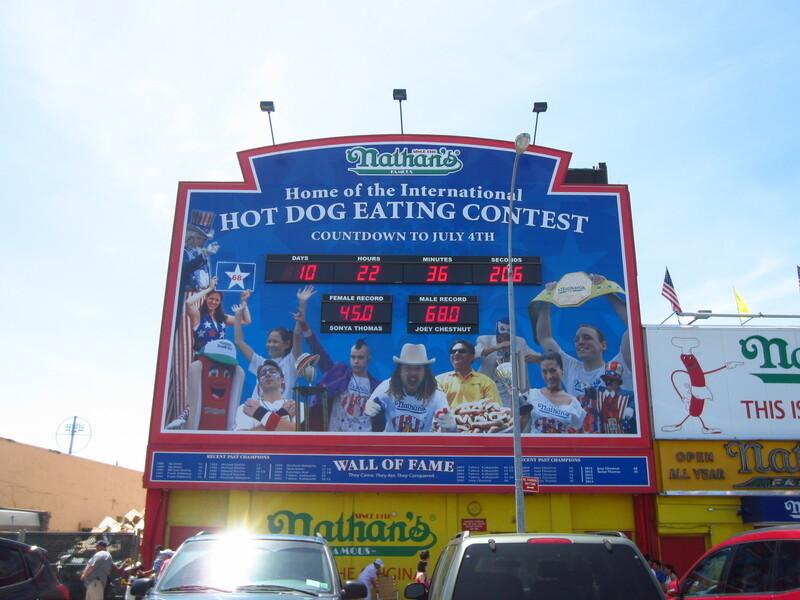 I couldn’t help but notice the scoreboard for the Nathan’s hot dog eating contest, which is held at Coney Island annually. Yep, apparently the world of competition eating is alive and well. It’s a disgusting pastime; there are countries in the world with real hunger problems. The current record holder is up to 68 hot dogs, and should probably go home and re-think his life. We wanted to do something a little different in New York City than walk through busy streets. And it was a great day out! Coney island is reachable by several subway lines (I don’t know exactly which ones), but we took around 45-50 minutes on the D train from Bryant Park.